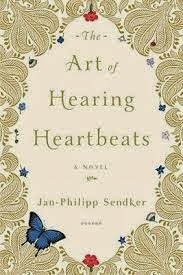 a book chick: "The Art of Hearing Heartbeats"
"The Art of Hearing Heartbeats"
my take: Pictured on the top of my pile of things to read for a trip to St. Lucia, daughter said to start at the bottom of the pile. Hmmm. I'd seen this in the Costco magazine. When that arrives in the mail I go right for the book section to see what they've picked for the month. I almost always like it, and have bought it nearly every time. Okay, I want to be the woman who has that job. I love Costco, I love books, I love reading, I love recommending. I'm perfect for it! I digress. She picked this and so I bought it. Daughter read it and wasn't wowed. What to do? Leave it home? Lug it along? I counted and recounted and figured I'd need it to have enough to read. And glad I did. If you don't like magical realism, or something a bit fantastical, maybe this won't be your best read. When I have the divine fortune to read a book a day for several days, I'm always reminded how easy it is to enjoy books you might otherwise not. This book demands a bit more suspending of belief than your average novel and that's sometimes hard when you're reading snippets here and there. Reading it in a day eases the disjunction and helps one get lost in the otherworldliness of a fairy tale. This is a love story of the stretchiest kind. Maybe I just wasn't in the mood for magical realism? Didn't love, but I didn't say I didn't like it... just not my first choice when there's also a Joshilyn Jackson book on the pile. Just saw at Target that there's a sequel recently published - you should check it out and let me know if I should give it another shot!